The Jandel HM21 is a portable meter designed for use with a four point probe to make sheet resistance and/or volume resistivity measurements. The unit is battery powered, however, it also includes a universal AC power adapter so that it does not have to run on batteries when portability is not important. 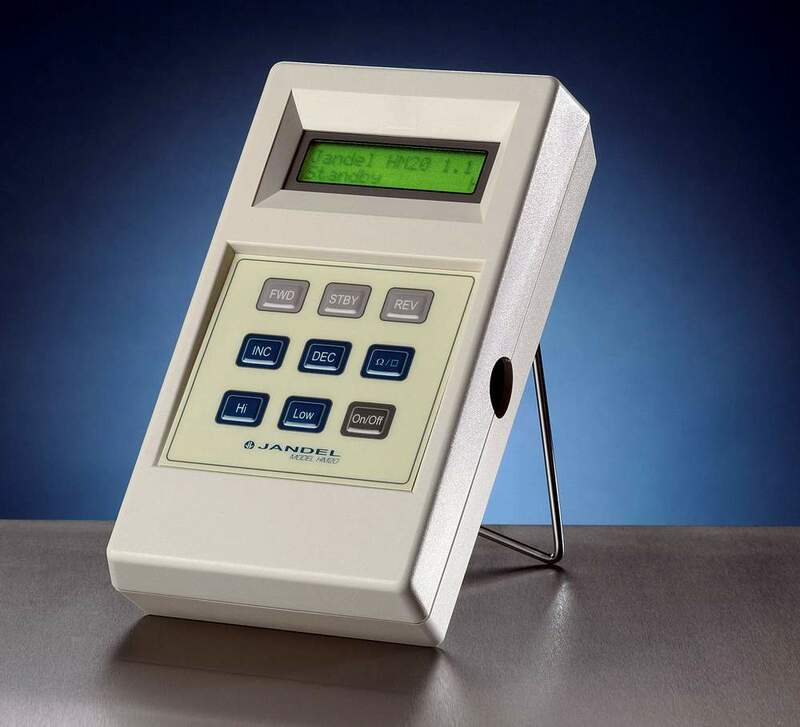 The HM21 supplies a constant current and displays either the resultant voltage or the sheet resistance in ohms/square depending which function has been chosen. The sheet resistance measurement range is 1 ohm/square to 10 Megohms/square (in practice you can measure down to around 0.01 ohms/square, but the accuracy may be compromised slightly). This equates to a bulk (or volume) resistivity range of approx. 0.01 ohm.cm to 100 Kohm.cm. The current is changeable in 6 steps – 100nA, 1uA, 10uA, 100uA, 1mA, 10mA. The compliance voltage is above 8.5V but slightly reduces to 7.5V at 10mA, however 10mA would usually only be used with more conductive samples where the compliance voltage is not so critical. The unit is push button operated. The current is increased with the ‘INC’ button and decreased with the ‘DEC’ button. Forward and reverse current (opens new window) can be selected using the ‘FWD’ and ‘REV’ button. When the battery mode is used the unit returns to standby automatically to save power and turns off altogether after some period of inactivity. The automatic time to return to standby is 70 seconds with low current and with the 3 highest currents 40 seconds. This is because the lower current ranges are used with higher impedance which can take longer to settle, and the higher currents drain the power faster. The unit can be zeroed to remove any offset by pressing the Standby button when the unit is already in Standby. The HM21 includes on-board non-volatile memory so that several dozen measurements can be stored in the unit and then dowloaded to a PC later. The HM20 model (which did not have the on-board NVM memory) has been replaced by the HM21. NOTE: PC Software for the HM21 Hand Held Meter is INCLUDED. Software Manual for the Jandel HM21 (PC software is included).